German-born Käthe Schirmacher studied at the Sorbonne, worked for a time in England, and earned a doctorate in Zürich. She traveled around Europe delivering lectures on various aspects of German culture and women’s issues. She co-founded the Association of Progressive Women’s Groups and the World Association for Women Suffrage in 1904. During World War I, her politics shifted rightward; after the war, now in Germany, she was elected to the National Assembly as a representative of the German Nationalist People’s Party, the largest right-wing party of the Weimar Republic before the rise of the Nazis. 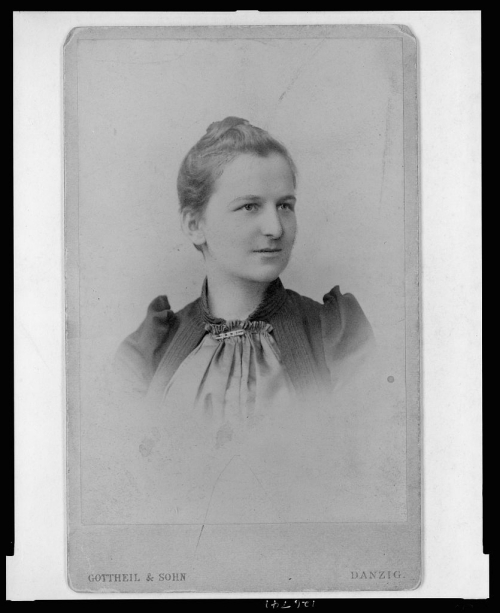 Her published works include Die moderne Frauenbewegung (The Modern Woman’s Rights Movement, 1909) and Die Suffragettes (1912). Gottheil & Sohn, Danzig. Käthe Schirmacher, German Feminist, 1893. Library of Congress, Prints and Photographs Division, Washington, D.C.